Hi guys! I hope you had a great Memorial Day weekend! 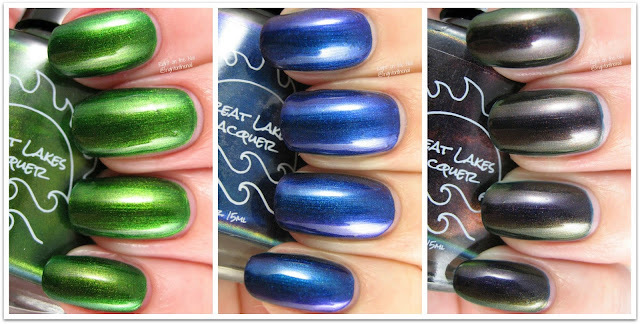 Tonight I have the last 3 polishes from Great Lakes Lacquer's Polishing Poetic collection. I may have forgotten to mention that Great Lakes Lacquer is one of the guests for Hella Holo Customs this month. Mariah has 3 polishes up for grabs until June 5th so get them while you still can (you need to be a part of the group to purchase these). With that said, let's get into these swatches! Up first is Leaves No Step Had Trodden Black which is inspired by a poem by Robert Frost. The polish has a grassy green base with flashes of gold and blue at extreme angles. The gold stands out quite a bit, but you can only see the blue in the bottom photo. It's a beautiful color, and it really stands out among the rest of the collection. I had no issues with the formula and I needed just 2 coats for full opacity. What a mysterious color! The Dying of the Light is a dark, inky base with flashes of purple/red/gold/green. Basically it looks like a cool oil-slick. The polish is inspired by a poem written by Dylan Thomas, which I've never read to be honest. This is another hidden gem in the collection...one I enjoyed a lot more than I expected. It was extremely pigmented, and I only needed 2 coats for the swatches above. And the final polish I have to show you is called The Tune Without Words which was inspired by a poem written by Emily Dickinson. I feel as though my swatches don't do this one justice. The different colors are more apparent in darker lighting and my last photo just doesn't cut it. It's a multichrome that shifts from royal blue/aqua blue/purple/orange. You can really see the changes in the bottle. This is another 2-coater. I really love this collection, and I'm so glad I went ahead and bought all of them. If you're going to twist my arm and make me pick my favorites, I'd have to choose Like Air, I'll Rise, The Centre Cannot Hold, In a Handful of Dust, and The Dying of the Light. What can I say, I really liked the holo polishes. These are on sale right now on the Great Lakes Lacquer site, and each polish retails for $11-$12 each, or go ahead and get the whole collection for $87...you deserve it. Make sure to check out what Great Lakes Lacquer is up to on their Facebook and Instagram pages as well.